Ford Farm Cave Aged Cheddar Truckle 1.7kg; To see the full range of Ford Farm Cheese Truckles, click here! 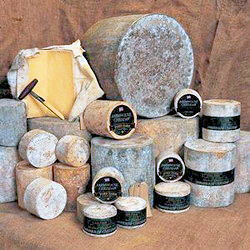 Ford Farm Cave Aged Cheddar Truckle 1.7kg; Also available as a cutting Cheese; click here! Aged in Wookey Holes famous Cheddar Caves, which have constant temperature and high humidity. This makes for ideal storage conditions and allows the cheese to develop an earthy characteristic and distinctive nutty flavour that is associated with Cave Aged cheeses. These Ford Farm cloth bound Truckles from The Cheese and Wine Shop make great gifts, and they are available all year! Cheddar is synonymous with the West Country - where it was originally made in the fifteenth century - and is the world's favourite cheese. Carefully matured under controlled conditions for between nine and twelve months, this Mature Cheddar has a wonderful flinty texture and a distinctly savoury flavour with a refreshing sharpness. An unusual but rewarding accompaniment for this cheese is Guinness. A popular and equally enjoyable companion is a Cheese and Wine Shop Merlot. Please Note; The Mould on the outside of the Cheese occurs naturally and is an integral part of this traditional cheese. As you walk across the fields and through the woods to the cheese house, admire the spectacular views of the sea and marvel at how this grass becomes cheese available in shops both in nearby villages and oceans away. Ford Farm is by the sea in a lovely part of Dorset, steeped in history, literature and cheese-making stories. Incomparable cheese and excellent and helpful service. What more could one ask? Perhaps that when the courier service managed to lose the cheese originally sent in the run up to Christmas, the immediate despatch of a replacement? That was no trouble at all and the replacement arrived within 24 hours. Thoroughly recommended.